Rabban Gamliel, the son of Rabbi Yehuda ha-Nasi, said: It is good to combine the study of Torah with an occupation, for the exertion of both keeps sin forgotten. All Torah study that is not accompanied by work will come to nothing and bring sin in its wake. Everyone who works on behalf of the community should do so for the sake of Heaven; the merit of their forefathers will sustain them, and their righteousness endure forever. And as for you, I [The Almighty] will account you worthy of great reward, as if you had done [everything]. In this mishna we learn about the connection between Torah learning and derech eretz. In the context of the mishna, the Rabbis define derech eretz as an occupation or trade (Rabbenu Yona argues that the phrase derech eretz means different things in different contexts). They also relate it to one’s behaviour: humility, decency, manners. The message here is that behaviour and one’s general conduct in the world at large should clearly reflect Torah values. What one learns through Torah should permeate every aspect of one’s life. Rabban Gamliel does not say that to a life of work one must add Torah; a life devoid of Torah study is unthinkable to him. Rather, he is reminding us that we must live through the Torah, with the Torah always in our minds and hearts. Where the mishna becomes unclear is in how much one should involve oneself in the world outside of Torah. 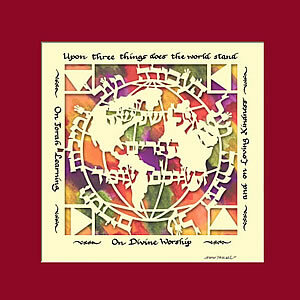 It seems that Rabban Gamliel is telling us that we must have a foot in two opposite worlds – the world of Torah study and the world of work, the world of the land. The preposition ‘im’ is important – ‘with’… does the study of Torah seem more beautiful when we are exposed to some of the challenges of the outside world? (The role of this preposition is debated in Berachot 35b). The crux of the debate is over which term is primary – the one that precedes the im or the one after it, that is, is work or derech eretz more important than Torah? In many ways it seems that this debate is central to two divergent ways of Jewish living as personified by the Modern Orthodox movement in contrast to the Hareidi movement. Regardless, it is clear that there is a connection between these two worlds that should be nurtured and that the study of Torah should influence our conduct in the wider community. It is perhaps this message which ties the two parts of this mishna together: part 1 which seems to be debating the value of Torah Study and derech eretz and part 2 which discusses those who are involved in the community. In Pirkei Avot, the only activity which we are told to do ‘for the sake of heaven’ is work on behalf of the community. The mishna is reminding us that our motivation in this type of work must not be dictated by a desire for glory or recognition, rather it must be pure and idealistic in the way that the Torah teaches us to behave. The implication is that the community is made up of all these types of people and it is our duty to behave as the forefathers Avraham, Yitzchak and Yaacov. The mishna teaches us that not occupying ourself fully (both in terms of Torah learning and work) will lead us to sin, to gossip, to idleness. It is not our position in the world to judge others. We are expected to behave ‘betzelem elokim’ (in Hashem’s image) and a central part of Pirkei Avot teaches us what is involved in this pursuit. Finally, it is interesting to note that this mishna uses two different terms to refer to work or occupation – derech eretz and melocha. The latter is a word that rings with familiarity because of its connection with the 39 prohibited activities relating to Shabbat observance. Melocha clearly refers to work which involves creation and the mishna seems to be leading us to the conclusion that we should ‘make’ something with our Torah learning, that Torah learning should be applied to life. One cannot exist without the other. Thus we are reminded na’ase ve’nishma – we will do and we will listen/heed. This is the essence of Judaism: learning and action and it is this that runs at the heart of the mishna. Rabbanit Kanievsky passed away over a month ago at the age of 79. Over 50,000 people attended her funeral. She was more than just the Rabbi’s wife, more than a Rabbanit, many called her “Admorit” (the feminine form of admor, a title of honour usually reserved for Hassidic leaders). Admor is an acronym for Adoneinu, Moreinu, ve Rabbeinu – meaning Our Master, Our Teacher, and Our Rabbi. Women from all walks of life flocked to The Rabbanit for brachot of all sorts: for marriage, health, wealth, children and more. The story goes that a man who did not have children despite many years of marriage went to Rav Kanievsky for a bracha. While he was waiting in line for his turn to get into Rav Chaim’s room, Rabbanit Kanievsky noticed him, and that he seemed upset. . She asked him what he came for, to which he responded that he came for a bracha for children. Rabbanit Kanievsky gave him a bracha that they would give birth to twins in the coming year. He answered amen, and took his turn to get a bracha from the rav as well. The avreich told Rav Chaim about the meany years they did not have children and what they went through, and asked that Rav Chaim daven on their behalf. He also mentioned that the rebbetzin had just given them a bracha for twins. Months later, the fellow came back to Rav Chaim Kanievsky reporting that his wife had just given birth to triplets! An fascinating article about The Rabbanit appeared in Hamodia Newspaper and can be read here. There are certain events of such impact on Klal Yisrael, that it is impossible not to comment, even if the writer fears he has nothing to add. The passing of Rebbetzin Batsheva Kanievsky, zt”l, over Chol HaMoed Sukkos, was such an event. My friend Rabbi Ron Yitzchak Eisenman of Passaic, New Jersey captured a poignant moment from one of his visits to the Kanievsky home. Rabbi Eisenmann was ushered in one night while the Rebbetzin and her husband the venerable sage Rav Chaim Kanievsky, l’badeil l’chaim tovim v’aruchim, were sitting alone at the dining room table. Who can possibly replace her? Who will offer succor to all those in need? As Shabbos Chol HaMoed came to an end I was shocked and saddened as I heard about the passing of Rabbanit Bat-Sheva Kanievsky- wife of the beloved Tzaddik, Rav Chaim. I had the privilege of meeting and speaking to the Rabbanit – as she was referred to- many, many times. In fact I do not think I ever visited her husband without exchanging a word or two with the Rabbanit. Everyone I knew referred to her as The Rabbanit; not the ‘Rebbetzen’ as we refer to the wife of the rabbi in America. However, Rabbanit Kanievsky was more than just another wife of a rabbi; she was ‘The Rabbanit” – a title of regality. As always, I cannot speak for anyone other than myself. I certainly did not know here ‘well’ and would never claim to have spoken to her at any great length. Therefore, what I am about to present is nothing more than my personal recollections of my brief encounters with ‘The Rabbanit”. For one thing she was not a woman in the ‘wings’ or a woman who lived in the shadow of anyone. She was always there and she was quite visible; that being said she was the epitome of modesty and purity. She attended Shul daily- always with her husband. She was there at four in the morning for Vasikin and she was there with him for Mincha. The Rabbanit was a lively and potent woman; simultaneously powerful and productive; progressive yet passive; happily accepting her roll as the help-mate of her husband. However, notwithstanding her devotion to her husband, she was aristocratic in her own right. After davening she was the only rebbetzen I ever observed who was literally swamped and surrounded by women as she slowly made her way from The Ledderman Shul to her home. Throngs of women clung to her and observed her every move. In an era when so many young (and not so young) Jewish women are sorely searching for a role model and ‘hero’- The Rabbanit was there to fill the void. When a young woman from America was seen in the women’s section early in the morning, The Rabbanit would make sure to shower her with even more love than usual. Every morning she went to all the women who arrived early for Shacharis and insisted that each and everyone recite their Brochus out loud so she could answer Omein. She was mobbed by all types of women daily. Religious and not yet religious; Ashkenazim and Sephardim, young and old; all were drawn to her magnetic personality. She warmly greeted everyone; waiting and standing long hours in the hot son dispensing Brochus to women in need and offering words of comfort and chizzuk to everyone. I recall vividly the time I brought my oldest grandson to Rav Chaim for his first haircut. When we arrived she had stepped out of the room for a minute; however, when she returned and realized why we had come she rushed to find a candy to give him and made sure to add a few more for his siblings at home. Here was a woman whose grandfather, Rav Aryeh Levin Zt”l was known as the Tzaddik of Yerushalayim; whose father- Rav Elyashiv is the halachik arbiter of our generation; who husband is … Rav Chaim! And she is giving me encouragement with such love and such caring that I will be improved if I attend her father’s Shiurim! On one of my first visits to the Rebbe, I asked one of the attendants if one recites the brocha for seeing a Talmid Chochom when one sees Rav Kanievsky. The man replied in the affirmative, however, before I walked into her husband’s room- The Rabbanit said emphatically, “Yes, you could say the brocha, however, do not say it. The Rav does not like anyone saying the brocha in his presence.” Of course that ended the discussion. One day I arrived and only she was home. I asked where Rav Chaim is and she replied that he was busy now. By the look of my face- she could see that I was disappointed. She then looked at me and said, “Wait over there by the door. Soon he will be going to Mincha; if you wait there you can have a few minutes with him before he leaves the house!” Once again her care for the individual was prominent in her personality. My most poignant and heartfelt memory of The Rabbanit was on a cold chilly night in December. I arrived and knocked on the door. Aryeh Kanievsky- their grandchild answered the door. Over the years Aryeh and I have developed a relationship and he motioned me to enter. As I walked into the house I observed a sight reserved for the angels above. There on the dining room table sat Rav Chaim in his crinkled and mis-buttoned blue sweater and across from him sat The Rabbanit. There was no other human being in the room. I was too scared to enter and therefore for the next few minutes I stood quietly as I took on the role of the proverbial fly on the wall as greatness transpired all around me. The Rabbanit sat in her seat surrounded by piles and piles of small pieces of papers. Each one of ther scraps contained the heart and soul of a Jewish person. 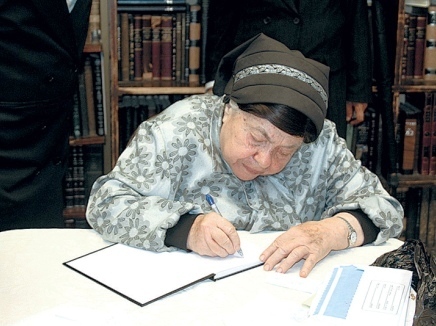 On one a woman had penned her request for a Shidduch- a soul mate. On another, a man asks for a recovery from cancer for his infirmed wife; on one slip is the request for children- the tear droplets are still visible on the moist paper. The Rabbanit picked up each and every piece of paper as if it was her child. She gently unfolded the paper and with warmth and love she read each and every request to her husband who sat across from her. As I stood there I could not believe the sight which my eyes beheld. In front of me sat a man whose every second is precious and accounted for. And here is a woman who has many children and grandchildren to attend to; however, they are sitting together in the precious and rarely had private time together- praying for Jews whose faces they do not recognize and whose last names they do not know! If this is not greatness, what is? By the way the ritual played out I could tell that this was a daily occurrence; the Rabbanit slowly reading the day’s requests for divine help and the Rav responding with the appropriate Tefillah. Their care and their concern for all Jews touched me to my core. This is Rav Chaim and this was The Rabbanit. I saw greatness in the Rabbanit, and now it has passed.